Have someone on your shopping list asking for a drone this year, but know a full sized camera toting one is out of the question? 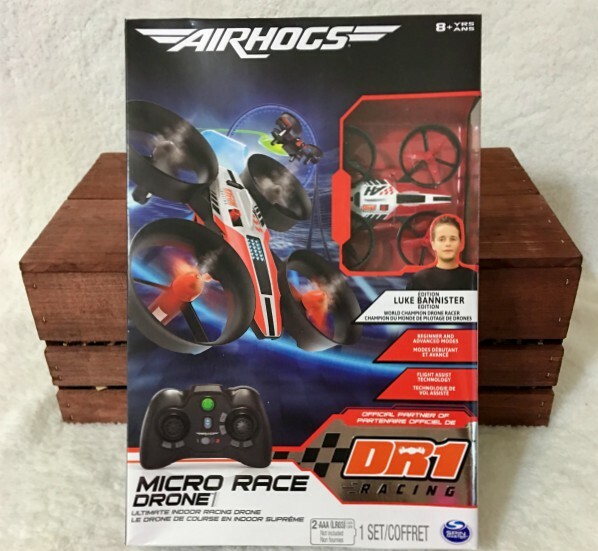 Then start them out with an Air Hogs Micro Race Drone. It's a micro sized drone fit for everyone. This drone is perfect for indoor flying and a great way to learn the basics. It comes with a micro sized drone, wireless remote control, and USB cord for charging. My son thought he would be able to fly a full-sized drone like it was no big deal, boy was he in for a surprise. It wasn't nearly as easy as he thought it would be from the times he watched others do it. I have to say he was pretty happy when I gave him this micro-sized one to practice with first. He said having this one to practice with really helped him learn alot. And he had a really good time playing with it and teasing our cats! • Compete in adrenaline-fueled indoor drone racing with this nimble flyer that is perfect for agility in small spaces. • Flight assist technology with automatic take-off/land and height-lock makes racing easy for even first time flyers. • Engineered with durable ducted propellers for enduring tumbles and crashes.